Question 1: What is the minimum descriptive content of a work package? (A) Specification of the goal of the work. (B) Prerequisites of the work in terms of tools and material. (C) Description of the desired work result and its cost. (D) Description of the work in terms of verb and object. Question 2: What is the lowest level of a WBS? Question 3: Which of the following statements is correct? The WBS shall be free of contradictions. For each WBS we need a PBS. The WBS shall be free of redundancies. The PBS does not contain work packages. The lowest level of a WBS contains only work packages. The PBS shows all the work of the project. Question 4: Determine the critical path (this is the core part of test 3; take paper, pen, and some time and try). In order to work on this task you need the network diagram. 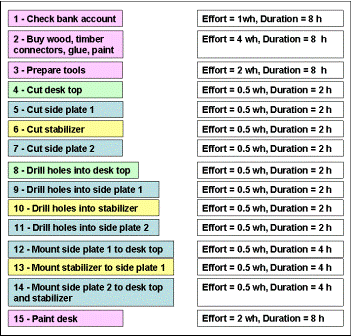 Here you can download it: Network Diagram of the "Desk Project"
The following table contains estimated effort and duration of each work package of the desk example: effort in working hours (wh), duration in hours (h). effort = 2 wh, duration = 8 h, meaning that we will shift the actual work of preparing the tools, that block of 2 working hours, within a time frame of 8 hours, when ever it fits best. (A) 1 - 2 - 4 - 5 - 6 - 7 - 13 - 14 - 15. (B) 1 - 3 - 4 - 5 - 6 - 7 - 13 - 14 - 15. (C) 1 - 2 - 4 - 8 - 9 - 12 - 13 - 14 - 15. (D) 1 - 2 - 4 - 5 - 6 - 7 - 11 - 14 - 15. Question 5: What is the duration of the critical path? Question 6: What is the total effort of that project, in wh? Question 7: What helps us to prioritize risks? (A) Calculating the probability of each risk. (B) Multiplying probability with impact of each risk. (C) Calculating the impact of each risk. (D) Neither one of the above.